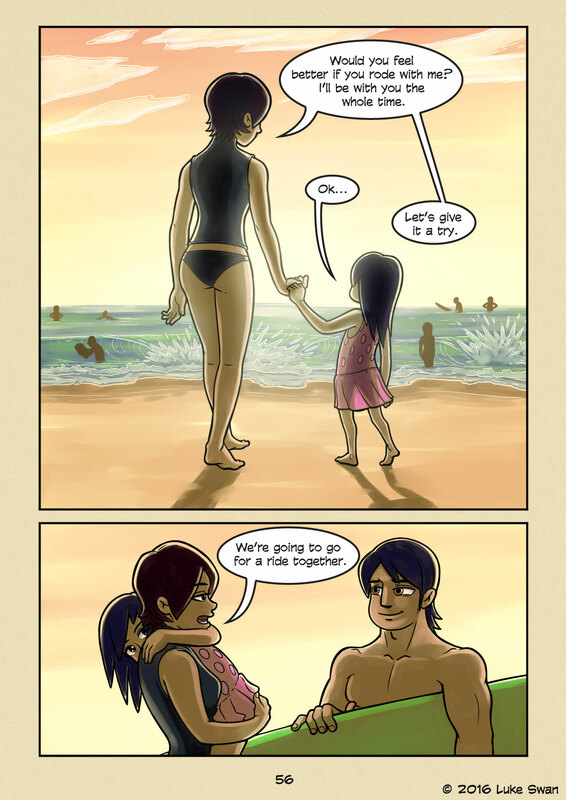 Surfing with Mom (#056) | Web comic "Surfer Joe"
I have few candidates, but I’m not sure which one came first. Maybe it was building a model Jeep with my Dad at a cabin by the lake. I don’t remember much, just a fleeting moment. Most of my early memories are like this. I misremember things more often than not. Some of my memories are even completely made up. For example, I have a very clear memory of when I was still in diapers and I had done my business. My mom was changing me and some of my poop ended up on the hardwood floor. My sister, thinking it was chocolate, picked it up and ate it. I’ve mentioned it to my mom and sister before and neither of them seems to remember it. It’s not something a person forgets easily, especially in my sisters’ case. So I must conclude that I had either made it up or saw it in a dream. Yet it is still the most vivid memory of my childhood. Then there are moments that I’ve been told about that I have no recollection of. Most notably is when my Dad blew himself up in front of my eyes. My mom has told me the story at least a dozen times, but I can’t remember any of it. I wish I could.